At work, a few years ago, a couple of fellows were talking about the new Netflix series Luke Cage. As I like super hero stuff, I asked about it. They explained the premise of this ordinary young man that transformed into a super strength hero, with impenetrable skin. The variety of Marvel shows is head-spinning. Then they mentioned Jessica Jones, which was the first Marvel television series on Netflix and the show that introduced the Luke Cage character. That led to the next series, Daredevil; then Iron Fist, The Defenders and, finally, The Punisher. My head was spinning by this time. I started watching Luke Cage on my next day off. I ended binge watched and finished it in less than a week. I had actually started watching Jessica Jones, first, but grew bored quickly and switched to Luke Cage. If you really want to make sense of what's going on in this Marvel Universe, you have to watch Jessica Jones, first. 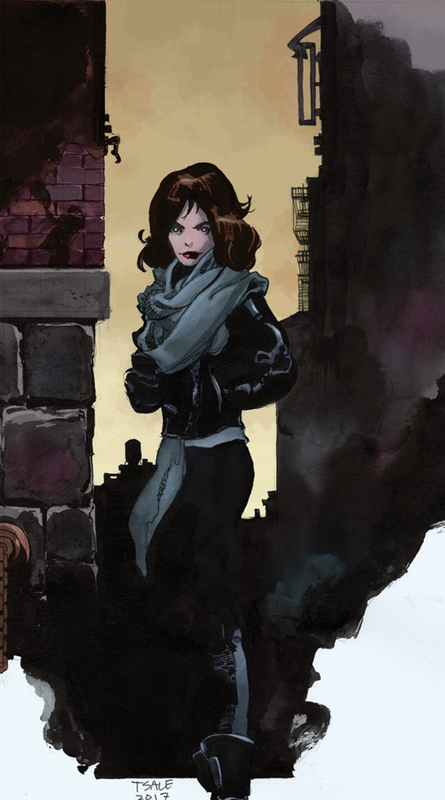 I went back to it the following week and the pace of Jessica Jones really started to pick up. Jessica has her own detective agency, "Alias Investigations," and it works for her because of her enhanced strength and uncanny talent for getting the truth, no matter who gets in the way. Jessica's nemesis throughout the first season is Kevin Thompson aka Kilgrave, played by David Tennant. He is a terrible man who doesn't see himself as terrible. His ability is to control other people’s minds at will because he produces an airborne virus that lets him control people for up to 24 hours. It was the scientist parents, of Kevin Thompson, that subjected him to many evil experiments, during his childhood. The experiments created the sociopath that he became. His obsession with Jessica is to show his love to her by killing people around her. Kilgrave torments Jessica for one season, almost. He torments her through all of season one, but Jessica finally gets close enough to him in the season finale, letting him think that she is under his control when she really is not. As he embraces her, she twists his neck, instantly killing him and immediately releasing everyone under his control. She has a nice touch. Season two, of Jessica Jones is much different. Jessica is battling her inner demons, one of which is a hallucination of Kilgrave. He is egging her on to kill the people that are getting in her way. It’s after she kills a corrupt and unstable prison guard that this version of Kilgrave appears. Adding to Jessica's misery is her long lost mother, who appears looking to find her daughter. Jessica had thought that her mother was dead. It turns out that mom was saved by the same scientist that gave Jessica her own powers. While Jessica is stable, though prone to bouts of drinking and anger. Her mother can lose her temper very quickly. She can or will kill or hurt anyone that gets in her way. All through the series, a sister, Trish Walker, played by Rachael Taylor, helps Jessica. Trish's mother adopted Jessica and the girls became very close sisters. Trish won't admit it, but she is jealous of Jessica's powers and wants to try to get them as well. There is not enough room or time to go through the entire series, so all I can tell you is this. Watch it. Enjoy it. Then wait for the next season. The series is good television. Jessica Jones is a television series at its best. Still, it certainly does not fit regular network television. Enjoy it, but be prepared for violence and dark look into the seedier side of life.